As per census Prakasam has a population of 3,397,448 in 2011 out of which 1,714,764 are male and 1,682,684 are female. 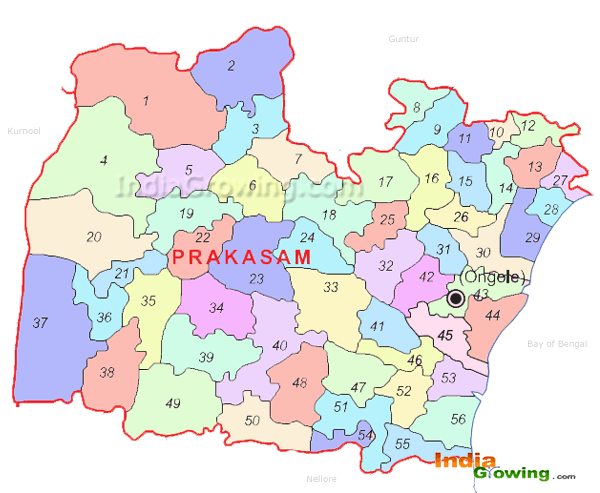 Expected population of Prakasam in 2019 is between 3,771,168 and 4,416,683. Literate people are 1,904,435 out of 1,107,686 are male and 796,749 are female. People living in Prakasam depend on multiple skills, total workers are 1,700,567 out of which men are 991,842 and women are 708,725. Total 264,818 Cultivators are depended on agriculture farming out of 189,321 are cultivated by men and 75,497 are women. 721,512 people works in agricultural land as labor, men are 347,300 and 374,212 are women. The Prakasam average altitude (elevation) 100 meters above sealevel. Hi sir,this is manojreddy from zuvvaleru.our village is based on farming.But there is no water in our village since last 3 years for farming.we have been living in very difficult stage in our village due to drought especially there is no availability of water to drink water in summer.parents began to stop thier children's education becuase of many financial problems.Their is no support given to us by any political leaders.we are very much interested in playing games. But we don't have any ground to play games.so we are waiting for your support as soon as possible. Until still today they are no roads Please respond our problem as well as fossibile, Thanking you sir JAI HIND. I am srinivasa rao, advocate, ongole, originally i am the native of paletipadu village in jarugumalli mandalm, prakasam district due to my advocate practice i came to ongole aND SETTLED AT ONGOLE, I GOT OWN RESIDENTIAL HOUSE AND ADDAR CARD ID PROFF ETC TO IN ONGOLE. here there is no apsrtc bus station,long back constructed and dimolished in 2010,but this is mandal head quarter and major revenue collected area.here aqua culture and salt manufacturing major commercial units.but some of panchayat presidents collecting money from those unit owners not yet to be collecting sevice charges and government taxes. Most of the people's from this mandal are facing the problem with fluoride water. So many times officers came to the villages, tested the drinking water[fluoride percentage from drinking water at Dharmavaram Village] and went. But till now no action from government side. This is the major problem not only Marripudi Mandal and it is from entire Prakasam district. Many times news are printed at news papers but no action. Requested our Honorable MLA Sri D.B.V Swamy please take action on this issue and resolve the issue. Thank You, ObulReddy. Hi sir, Greetings of the day, This is srinivas reddy from zuvvaleru we don't have an street roads in half of the village that's why we are facing a lot of problems during the rain season.and in summer we are facing a problem with water for animals and there is problem for drinking water also.I think the village is just behalf of 4km from podili mandalam but there is no development so plz take some kind of responsibility for our development sir one more thing we are facing a lots of problem with drainage system also plz help us as soon as possible. papineni palli lo mostu ga prablam drinking woter ku prablem ga unnadi mariu development anthaga ledhu mariu patha paddhathu lu akku vaga unatayi .